Windows 10 is now available in 190 countries as a free upgrade! Yes, Singapore is one of them and I am upgrading my two computers to Windows 10 now, and will be doing so on my HP Stream 7 a short while later. Termed as the most secure Windows ever, Windows 10 will be delivered as a service and kept automatically updated. If you are using Windows 7 or 8, you would have noticed a new icon on your computer taskbar and the opportunity to reserve your copy of Windows.
. Open Windows Update and you should see Windows 10 downloading / installing. Update: I received error 80240020 at the end of the preparing for installation bit. I’m trying this next https://www.microsoft.com/en-us/software-download/windows10. Continue reading for my top 10. Microsoft announced that Windows 10 will be available on July 29. Starting today, people can reserve their FREE upgrade if they choose. The reservation offer will be pushed to your computer, and would appear as a taskbar Windows icon. Mine has already appeared and I have made the reservation – you just need to enter your email account. Windows 10 will help people be more productive and have more fun, with a personal and natural experience that works across all their devices. Familiar, yet better than ever, Windows 10 will deliver ongoing feature innovations and security updates. Windows 10 will be available as a free upgrade to people using Windows 7 and Windows 8.1, enabling hundreds of millions of people around the world to upgrade to Windows 10 for free. Microsoft announced yesterday (April 16) the Lumia 640 and Lumia 640 XL will be available in Singapore on April 18 for S$299 and S$429 respectively. The latest Lumia devices are designed to offer more personal computing and increased productivity through seamlessly integrated Microsoft Office experiences, OneDrive storage, and 4G connectivity. Users, who buy the phone before 30 June, will be entitled to a 1 year Office 365 Personal subscription with 1TB OneDrive storage, and monthly 60 Skype minutes. Microsoft announced today the Surface 3. Like the Surface Pro 3, it’s a tablet that can double up as a full-fledged laptop. Microsoft is bringing a full version of Windows 8.1 to its new Surface 3. It starts at a retail price of $748 and pre-orders would commence from 1 April. The ability to run Windows apps and the versatile pen experience — great for taking notes or marking documents — make Surface 3 ideal for students, schools and anyone looking for a portable device to get things done. Coupled with the educational/academic discount, the Surface 3 might be a worthy laptop to consider for students and educators alike. With a thickness of only 8.7mm, the Surface 3 is essentially a smaller, thinner, more affordable, lower-spec version of the Surface Pro 3. While it is the lightest Surface yet (at 620g), the iPad Air despite the smaller screen is a significant 30% lighter. The new tablet features a 10.8-inch 1920 x 1080 display with a 3:2 aspect ratio. A 3:2 aspect ratio is more appropriate for document viewing, editing, a similar tablet experience to that of the iPad. Powered by the new quad-core Intel Atom x7 processor (Cherryview), Surface 3 is quick and responsive but designed to maximise efficiency with up to 10 hours of video-playback battery life. Geekbench scores are around 961 (single core) and 3271 (multi core). The i3 Surface Pro 3 is approximately double the single core performance. Stick to the i5 / i7 Surface Pro 3 if you need it to run computationally intensive applications such as for video editing. The other hardware bits are stereo speakers with Dolby Audio-enhanced sound, as well as a magnesium design finish. The Surface 3 now sports a three-position kickstand, which allows it flexibility in using the Surface 3 on a desk, sitting on a couch or just holding it in your hands. This is a different implementation as compared to the adjustable kickstand from the Surface Pro 3. The Surface 3 ships with full Windows 8.1 and can be upgraded to Windows 10 for free when available. They also come complete with a one-year subscription of Microsoft Office 365 Personal, including Outlook, Word, Excel, PowerPoint and OneNote, plus OneDrive cloud storage. In Singapore, the Surface 3 Type Cover is available in bright blue, red and black, and features an improved trackpad and keyset for fast, accurate typing, alongside four Surface Pen colors — silver, black, blue and red. It’s the same pen / stylus found on the Surface Pro 3, and while that comes packaged with the Surface Pro 3. 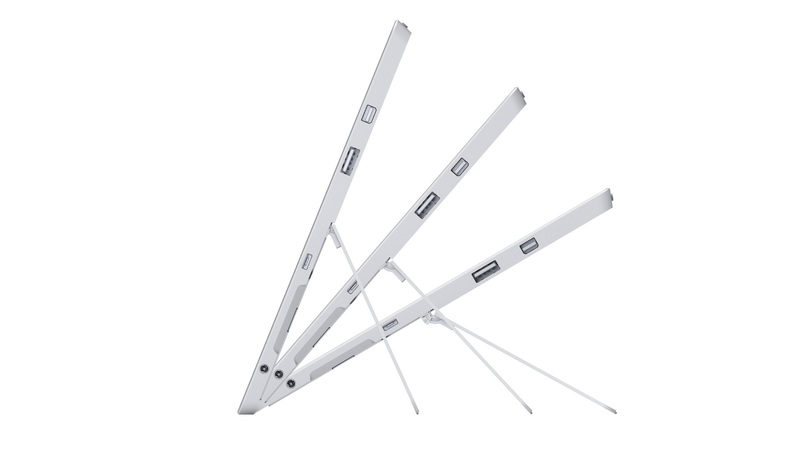 It is an additional accessory for the Surface 3. The Surface 3 Docking Station lets people easily connect to an external monitor and all their desktop devices, and Surface 3’s full-size USB 3.0 port, Mini DisplayPort, microSD™ card reader and Micro USB charging port make it compatible with the Surface Pro line of adapters and ready for quick and easy connections to a variety of accessories. The actual units would be available from May 5. Starting then, customers can begin purchasing Surface 3, Surface 3 Type Cover, Surface Pen, Surface 3 Docking Station and Surface 3 Screen Protector. If you are a Windows Phone or Nokia fan, Microsoft has the Lumia 930 in Gold for you to usher in the Chinese New Year. It’s the same slick device with top-notch display and a slew of integrated apps, but enhanced with an auspicious touch. With the Chinese New Year season upon us, enter the Lumia 930 Gold and make a striking statement at your family gathering! You would also get a free Swensen’s Yusheng set. The new gold Lumia 930 marks the high-end refresh of the model, with an anodized gold colour marrying sleekness and style. With a sharp crystal clear 5-inch Full HD OLED display, incredible imaging and video qualities from an advanced 20-megapixel PureView camera and seamless integration of Microsoft services, the Lumia 930 offers the best of the Windows Phone 8.1 experience, simultaneously supporting a wide range of third-party apps, such as Instagram, Facebook, and Spotify. It is a smartphone that carries high-end performance and digital functions together with the best of Lumia innovations, accentuated by a subtle gold that adds effortless class. The phone would also likely be upgradable to Windows Phone 10 when it is released this year, which helps ensure the longevity of your mobile device.